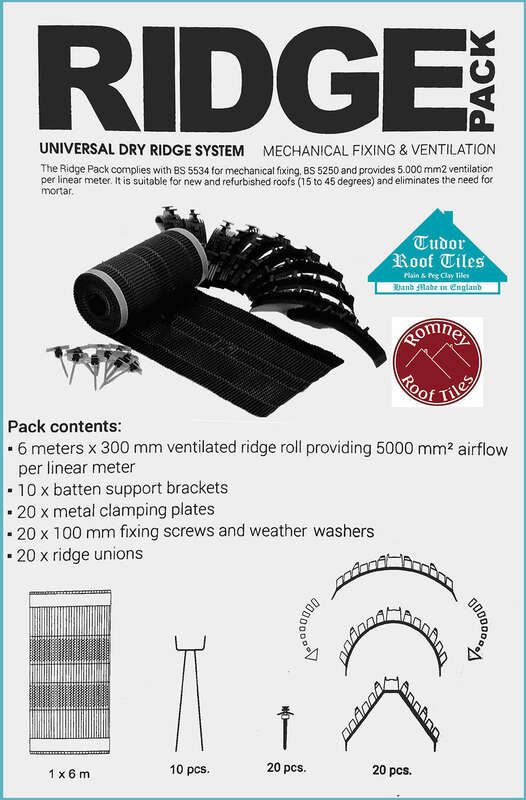 Manufactured for Tudor Roof Tiles by award winning roofing accessories producer Wa-Bis,Â Ridge Pack combines the latest research & experience to give an individual solution superior to existing products. ~ Â 6 metre roll of 300 mm wide precision grade corrugated aluminum that allows the roof to ventilate whilst avoiding water ingress. ~ Â 20 screws, washers and clamp plates for securing all types of ridges, including 300mm long ridges typical of handmade tiles. ~ Â 20 unions to ensure complete weatherproofing between each ridge, with each union being flexible to ensure a perfect fit no matter the ridge shape. ~ Â 10 batten support brackets. Ask your local stockist merchant for more details, or call us direct on 01797 320 202 for further details.